Since its beginning, CAZALAC has also had the important financial and technical contribution of the Government of Flanders (Belgium). This collaboration has resulted in the consolidation of numerous initiatives at the LAC Region, and currently is carried out by developing MWAR-LAC program. The Latin America and The Caribbean (LAC) Region. The total area of arid and semi-arid zones in Latin America and the Caribbean covers approximately 4.5 million square kilometers, including 22 countries from Mexico to Tierra del Fuego. A large portion of the population that inhabits these territories lives under poverty conditions in environments subjected to strong desertification processes, mainly due to water shortage and the lack of an appropriate knowledge on water management and preservation. Additionally, recurrent droughts make this condition even worse. Regarding the above, it may be concluded that the Region shows a critical need of developing sound water management techniques in arid and semi-arid zones, through an integral approach that includes technical, social and cultural aspects. However, there was no regional center in LAC to systematically address the severe problems caused by these extreme conditions of water shortage and impairment in arid and semi-arid environments. Therefore, CAZALAC’s operations will contribute to dramatically increase effort coordination and the identification of suitable strategies for the future. At a regional level, it is expected that the Center’s operations will have the following results: Improve the quality of life of people living in arid and semi-arid zones in LAC; contribute to attain sustainable development in the Region, by encouraging the generation and dissemination of the required knowledge regarding water management and preservation in areas affected by water shortage. To reinforce the Region’s technical, social and educational development based on an improved water management and use in arid and semi-arid zones in Latin America and the Caribbean and, in addition, to increase the role of local communities in developing a water culture. To promote scientific research on water issues and water management problems in arid and semi-arid zones in Latin America and the Caribbean. To encourage greater contact among researchers working in water resources in the Region. To disseminate results from research developed on water resources in arid and semi-arid zones of the Region. To provide education and training on a sound water management and to encourage improving the capacities of regional scientists. To establish a sustainable water management program in pilot areas in the Region, following the Dublin principles. Research Centers existing in the Region, which will be encouraged to increase or undertake new research projects on arid and semi-arid zones issues as a result of CAZALAC’s catalyzing or synergic effect. Productive companies linked to these zones (mining, tourism, agriculture, etc. ), which will be provided with a wider technological basis as a result of the guidance supplied by the Center on some key considerations on water resources development and management. National and local governments, which will have an improved capacity to respond to their tax-payers demands, since better tools to predict and mitigate disasters will be available and will contribute to attain a more productive and sustainable use of natural resources. Local populations, who will have improved access to technological development, which will help to alleviate poverty and decrease nature risks. Professionals and technicians linked to water management, who will increase their ability to face the system’s technical, economic and social requirements through education and training. La Corporación del Centro del Agua para Zonas Áridas y Semiáridas de América Latina y el Caribe, CAZALAC fue constituida legalmente a fines del año 2002, como respuesta a la inquietud de miembros del Comité Chileno para el Programa Hidrológico Internacional de UNESCO (CONAPHI-Chile), por contar con una organización dedicada a estudiar y coordinar iniciativas en gestión de recursos hídricos de tierras secas. A mediados de 2003 se conformó el primer Directorio del Centro, compuesto por el entonces Director General de Aguas don Cristián Humberto Peña Torrealba como Presidente, don Felipe del Río Goudie, Intendente de la Región de Coquimbo de la época como Vicepresidente y Tesorero, y don Jaime Pozo Cisternas, entonces Rector de la Universidad de La Serena como Secretario. 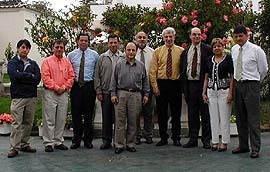 En al año 2004 se incorporaron al Directorio los representantes de las Universidades de Talca, Concepción, Chile y Pontificia Universidad Católica de Valparaíso. La estructura del Directorio de CAZALAC así constituida, se mantuvo hasta el pasado 28 de octubre de 2015, fecha en la cual, dando fiel cumplimiento al Acuerdo Conjunto entre el Gobierno de Chile y UNESCO de 2006, se conformó el Consejo de Administración del Centro. Por protocolo de todo Centro categoría II auspiciado por UNESCO, dicho Consejo de Administración tiene carácter internacional y cada país interesado en integrarlo lo solicita formalmente a la Organización, que aprueba o desaprueba la petición. Asimismo, debe integrarlo un representante del país que hospeda al Centro y un representante de UNESCO. Director Ejecutivo de CAZALAC Sr. Gabriel Mancilla, junto al Dr. Roberto Pizarro representante de la Universidad de Talca, y el Sr. Carlos Estevez Director General de Aguas. A la reunión de constitución del Consejo de Administración, celebrada el 28 de octubre de 2015 en dependencias de la Dirección General de Aguas, asistieron los miembros del antiguo Directorio de CAZALAC, a quienes se les agradeció toda la labor desarrollada, lo cual se simbolizó en un galvano recordatorio entregado por el Director Ejecutivo del Centro, Sr. Gabriel Mancilla. Por su parte, los integrantes del Consejo de Administración, de los cuales estuvo ausente sólo el representante del Gobierno de México, Sr. Felipe Arreguín, conocieron de parte del Director Ejecutivo del CAZALAC el Plan Estratégico propuesto para los próximos años y el Reglamento preliminar que regirá el funcionamiento del Consejo. Estos fueron aprobados con mínimas modificaciones. El Consejo de Administración se reunirá periódicamente, empleando para ello no sólo las citas presenciales, sino que también medios de comunicación remota. CAZALAC agradece la disposición y compromiso de su nuevo gobierno, como también la labor y dedicación que entregaron quienes integraron su Directorio pasado. 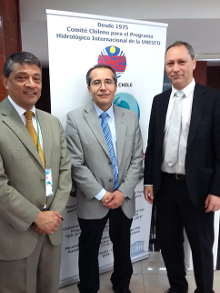 The Water Center for Arid and Semi-Arid Zones in Latin America and the Caribbean (CAZALAC), based in La Serena (Chile), will from now on be sponsored by UNESCO, under an agreement signed in this Organization’s Headquarters by Koichiro Matsuura, General Director, and Hernán Sandoval, the Chilean Ambassador. Therefore, CAZALAC is joining a network formed up by another eight centers dedicated to water resources under UNESCO’s sponsorship, which are located in Beijing (China), Belgrade (Serbia & Montenegro), Panama, El Cairo (Egypt), Teheran (Republic of Iran), Yadz (Republic of Iran) Kuala Lumpur (Malaysia) and Dundee (United Kingdom). Three more centers will be added in the next months to complete a 12 center world network. In the 33rd Session of UNESCO’s General Conference (United Nations’ Education, Science and Culture Organization), held in Paris on October 3 – 21, 2005 and in response to a proposal from the Chilean Government, the motion to accept the Water Center for Arid and Semi-Arid Zones in Latin America and the Caribbean – CAZALAC – based in the city of La Serena, was approved. Thus, although approval from the Chilean Parliament has not yet been granted, CAZALAC was recognized as a Second Category Center under UNESCO’s sponsorship and became the focal point of this organization regarding water management, research and development in arid, semi-arid and sub-humid zones for the Latin America and the Caribbean Region. Until CAZALAC was formed up in July 2003, there was no Regional Center to systematically address the severe problems caused by water shortage and impairment in arid and semi-arid environments. Thus, CAZALAC’s action area, considering arid, semi-arid and sub-humid zones in Latin America and the Caribbean covers approximately 4.5 million square kilometers, including 22 countries from Mexico to Tierra del Fuego, where a large portion of the population inhabiting these areas lives under poverty conditions and in territories strongly affected by desertification processes, mainly due to water shortage and the lack of knowledge and information to appropriately manage and preserve natural resources in general. Once UNESCO recently approved CAZALAC’s creation as a Regional Center under its sponsorship, actions undertaken by the Center to boost technical, social and educational development in the Region based on an improved water management and use in arid and semi-arid zones in Latin America and the Caribbean were reinforced, as well as those to increase the role of communities in developing a water culture through the establishment of a regional center aimed at coordinating activities, projects and programs. The initiative of creating this Center in La Serena has been supported since its onset in the year 2003 by the Regional Government of Coquimbo, the General Water Directorate, and the University of La Serena. Several international courses and research studies have been developed in this period with resources provided by UNESCO and the Government of Flanders, Belgium, in addition to the National Fund for Regional Development of the Government of Coquimbo. CAZALAC’s headquarters is located in the University of La Serena, which will directly benefit water management in the IV Region and arid and semi-arid zones in Chile.